B and I both had a lot of fun with ZombiU. If you’ve played it (or you’ve heard much of anything about it), you’ll know that they employed an interesting death mechanic… when (and I do mean when) the zombie hordes overtake you, you start the game again as a brand new survivor. If you want your stuff back, you have to track down the zombified version of your previous self, and take it. I died over 10 times, but the guy running the show, the Prepper, always had a gun and a cricket bat for me. Gotta hand it to the guy for being so well prepared :). Every new person: cricket bat, gun and a bob. I had to take some time to wonder where he stockpiled them all.. I died a dozen or so times and might have enjoyed killing my former self a bit more than I should. Ah, that’s right, there’s a BOB waiting for you too. And now that I think of it, a Prepper Pad. Damn, this just got expensive. There was something unsettling yet satisfying about it, wasn’t there? 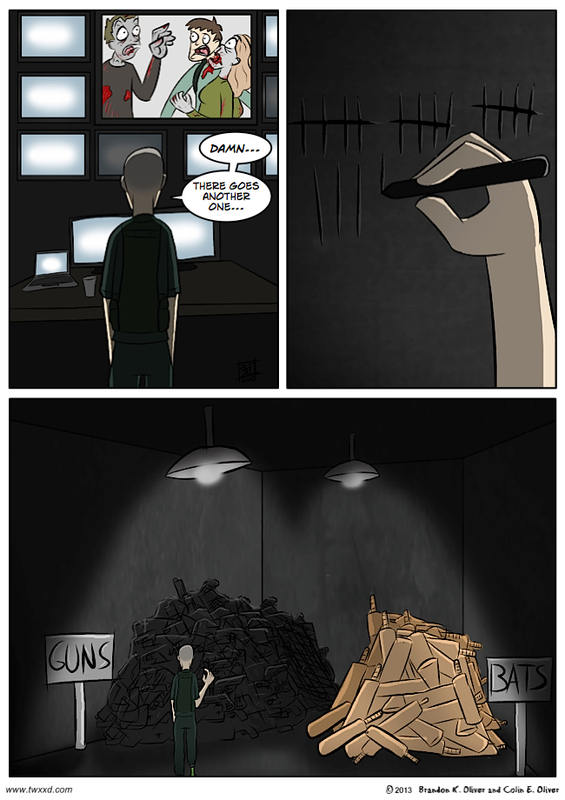 There aren’t enough cricket bats in that pile, nay, the world, for all the times I died. Maybe he’s got gnomes working on more?